If possible, The New School is getting cooler. 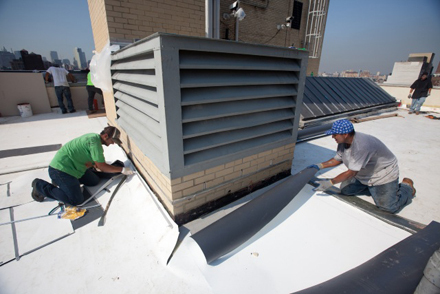 In August, The New School began replacing old black roofs all over campus with white ones. Starting at 66 West 12th Street, the process may appear to be nothing more than an aesthetic makeover. Instead it’s one of the steps the university is taking to reduce its carbon footprint. How does a white roof help decrease The New School’s carbon footprint? White roofs reflect sunlight instead of absorbing it, decreasing the heat absorbed by the building. A black roof absorbs and radiates heat, which can raise the surrounding temperature a few degrees,, explains Kilvert. All over the city, this ‘heat island effect’ comes not just from roof tops, but from pavement and other surfaces that absorb heat and raise the temperature of surrounding areas., The university is also adding insulation to sections of the roofs that for decades have had none. This will further improve the thermal properties of our buildings. The New School was among the first institutions to sign up for the Mayor’s Challenge to Universities. Developed by New York City Mayor Michael Bloomberg as part of PlaNYC, the challenge encourages local universities to reduce carbon emissions 30 percent by 2017. In September 2009, Bloomberg and former Vice President Al Gore launched the NYC CoolRoofs with a goal to paint one million square feet of rooftop white by October of this year. Conventional dark roofs increase demand for air conditioning to compensate for this hotter surrounding climate and heat gain. This greater demand has a domino effect: air conditioning uses electricity, and electricity is produced from coal, natural gas, and petroleum ‘ fossil fuels that emit carbon dioxide. Any reduction in our carbon footprint will likely be very subtle at first. But collectively, if every roof were white, it could add up to more significant energy savings for our buildings,, says Kilvert. Meanwhile, in the university’s lower depths, we are also in the process of replacing two 50-year-old boilers at 66 West 12th Street. The newer boilers will burn less carbon- intensive heating fuel and burn it more efficiently, so that for every unit of oil that goes in, more energy (BTUs) gets distributed throughout the building. For example, the old boilers may have had 30% efficiency whereas the new boilers could have 85% efficiency. So we will consume less oil and produce more heat,, Kilvert says. Other plans on the horizon include hiring a consultant to perform energy audits of nearly 500,000 square feet of New School-owned space and developing a strategic plan for capital upgrades. These improvements will bring the university up to date with the most efficient building systems to reduce energy consumption and shrink the university’s carbon footprint.